Tissue Paper Candle Holders are Grouped Together to Create Gorgeous DIY Wedding Centerpieces – Easy, Inexpensive, STUNNING! 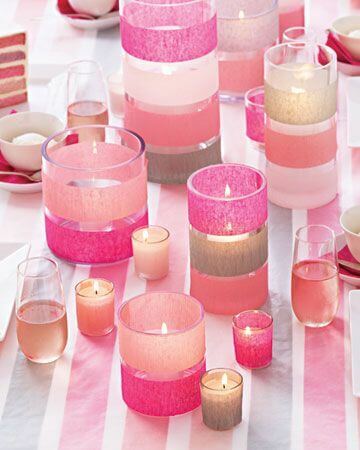 Here’s a terrific idea to add a burst of color to your reception tables, and its all done with candles and…. crepe paper (or tissue paper) of all things! This tablescape design is so easy for you to recreate, and doesn’t cost a lot at all (especially if you shop the dollar stores for the supplies), but you’ll get a look that is completely custom. You tables will have a designer look, and guests will be sure they were styled by a pro! Our DIY Team here at SuperWeddings.com has created these simple DIY instructions for you to recreate this look to make your own tissue paper candle holders or crepe paper candle holders (and matching table runner – see instructions further below). Create your own colorful custom candle holders for your wedding by starting with inexpensive standard clear cylindrical votive holders. And some crepe paper streamers in the colors of your choice. Using craft glue, carefully wrap a length of tissue paper or crepe paper streamer around each pillar candle holder and glue into place. You’ll want to apply a thin coating of glue over the entire surface of the streamer in order to get a consistent, non-clumpy look. You can combine more than one color or color tone on the taller candle holders if you like, as shown in the photo to really punch things up. If you prefer a monochromactic look, that’s perfectly fine, too. Now use the same technique on the votive candle holders by carefully wrapping either a length of crepe paper streamer or tissue paper around each votive holder, and glue into place. Remember, just like before, to apply a thin coating of glue over the entire surface of the tissue paper or crepe paper streamer in order to get a consistent, non-clumpy look. You can create a coordinating custom table runner using crepe paper streamers as well for a look that is really well put together, as shown in the photo. Its a fabulous, festive look, but its soooo easy to do. Just stretch lengths of crepe paper streamer from one end of the table straight across to the other end, allowing the streamers to drape over the side of the table all the way down to the end of the table cover. Place the streamers in parallel rows, making sure to keep the space between the streamers consistent. Crepe paper streamers and/ or tissue paper are sold in rolls where ever you buy party supplies (card shops, dollar stores, bridal stores, party supplies stores, or online. For best color selection, go to a specialty party supply store or shop online. A Designer Look on a Dollar Store Budget! The best part is that all the supplies needed to create this look from start to finish are so inexpensive! Be sure to check the dollar store for the candle holders – the larger dollar stores should have what you need for super-cheap. Have fun! Want more ideas? Check out our other DIY candle centerpieces you can make yourself. Like the idea of using a table runner on your reception tables? Get more inspiration by checking out these other table runner ideas.